Today’s cutting-edge, rigorous and relevant Career and Technical Education (CTE) pathways prepare youth for a wide range of high-wage, high-skill, high-demand careers. The mission of Career and Technical Education (CTE) in Indiana is to ensure an education system of high quality and equity for the academic achievement and career preparation of all Indiana students. Students in Indiana’s secondary CTE programs will gain the knowledge, skills and abilities needed for success in postsecondary education and economically viable career opportunities. 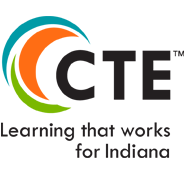 The following CTE pathway tool has been developed in order to assist Indiana schools in understanding and planning CTE course sequencing that will equate to CTE concentrator status for a student. list of aligned industry certifications. The outlined courses are listed in a recommended sequence considered to be best practice starting with foundational courses, followed by introductory, beginning, and advanced CTE coursework. These published CTE pathways and sequences of courses are the only CTE courses that count toward CTE concentrator status within the identified pathway.